We recently invited you to tell us what your top five flavors of potato crisps/chips are, and we were, frankly, amazed that so many of you did. Not only that, we were surprised by the variety of flavors you selected. It seems that there is a wide world of taste out there and we are not alone in our obsession with salty, potato snacks. So, preamble over, because there were such great flavor suggestions, the decision was tough, and there are three categories: honorable mention, close but no cigar, and, the one, the only, the champion top five. Bear in mind that only the champion wins the package of British crisps. Congrats Tina, we’ll be in touch to arrange the crisp transaction very soon! WOOT!!!!! Thanks guys, I’m so excited!! So thrilled!! So craving salty goodness!!! So many exclamation points that have yet to be used!!!! Thank you!!!! HAHAHA, so I am the tonya harding of potato chips? Does this mean tina should watch out? I think the best 5 won. Tina’s picks are tops, good job! We tried a new brand of salt and vinegar crisps that are extra vinegary. Can’t remember the name now, but they were good. Too bad I missed out on that post, but salt and vinegar is my favoruite. Totally love it! gosh, i cant believe i missed this! ha. I just posted today how I’m addicted to San Carlo Rustica’s chips. It’s hard to find the flavors I grew up with like Sour Creams and Chives here in Italy. Ummm!! 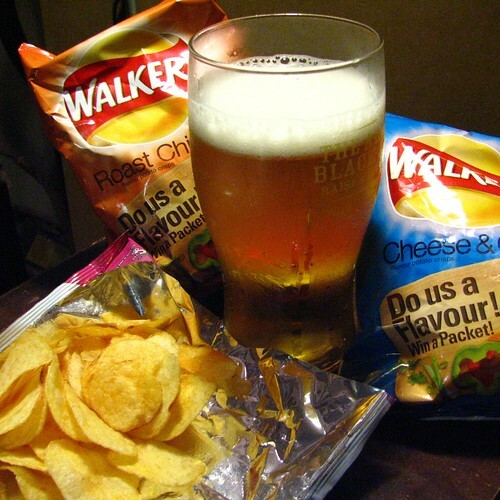 I used to live within walking distance of the Walker’s Crisp Factory at Thurmaston, Leicestershire. Also, there was factory No.2, not so far away. My husband went on a factory visit and …………to this day, isn’t very fond of crisps!!! Apparently, Walker’s Crisps have now ‘upped their game’. I think that you are too young to remember the blue bag of salt, hiding within the bag of Smith’s Crisps…………? Oh by the way, my favourite used to be cheese and onion. Rita – smith’s is/was an english company that got taken over by walkers, but i remember that a couple of bags of the full monty and warm cans of VB basically sustained me while I was backpacking around Australia…! Very informative post and comments. I’m craving the Full Monty variety now.